USA. Double top Nomex core soundboard with spruce on the outside and a cedar backsheet, lattice braced. 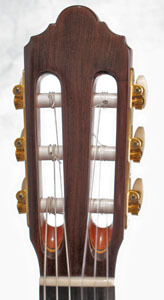 This is the same type of soundboard as the Signature models. 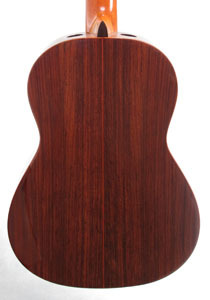 Solid Indian rosewood back and sides, 650 mm scale, 51 mm nut, sound ports, high C fret extension, Gotoh tuners, French polished finish. Kenny Hill has done players a great favor by making double top construction affordable, and in this instrument, an amazing value. Great projection, evenly balanced, full toned and clearly separated notes. 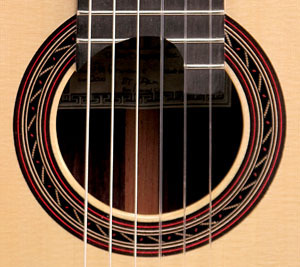 This spruce soundboard offers the classic contrast of the bright spruce tone color, compared to the cedar version. Hill’s reputation is already secure, and he has continued to serve guitarists by bringing concert quality within reach.